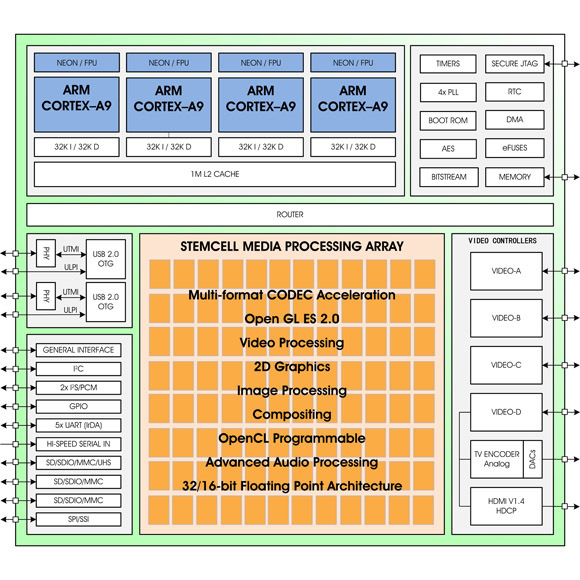 ZiiLABS ZMS-40 has Quad 1.5 GHz ARM Cortex-A9 MP Cores and 96x fully-programmable StemCell Media Processing cores, and supports wide range of accelerated video codecs including H.264, VC1, WebM (VP8) and HEVC, including ultra-high-resolution H.264 HP decoding of up to 3840×1080 for true 1080p 3D stereo, a rich and interactive desktop browsing experience, 2560×1600 (WQXGA) display resolution support, higher-quality video encoding and immersive OpenGL ES graphics and future support for High Efficiency Video Coding (HEVC). The up-and-coming HEVC standard (also known as H.265), besides other qualitative benefits, can also increase data compression ratio by up to 2X as compared to H.264. These technology wizardries are achieved by requiring many more times the computational complexity. HEVC claims to target the next generation Hi-Def TV market which can support scalable resolutions from 320×240 to 1080p with improved picture quality in terms of noise level, color and dynamic range, and all the way up to an incredible resolution of 7680×4320. Being fully programmable and with their massive parallelism, the 96 cores of StemCell Media processors can easily handle the onerous computational requirements of this new CODEC and support higher resolutions that are beyond today’s display systems. Creative Sound Blaster X-Fi’s Crystalizer and CMSS-3D audio effects. ZiiLABS’ enhanced Android supports not just cloning of the device display onto a TV but also APIs to enable dual independent displays, where the TV is showing a different screen from the device. For example, a user could be browsing the web for information while watching an HD video on the TV all at the same time. This usage model has a tremendous range of applications, and is only made possible due to the power of the ZMS-40. The ZiiLABS ZMS-40 is sampling to select customers based on the JAGUAR tablets running Android 4.0 (Ice Cream Sandwich).